mrs sew & sow: Beware! I do like your new quilt, though (but I'll deny saying it! ), and love the design wall idea - change their designation from WIPs to art/wall paper and you're no longer snowed under with projects. Clever! Oh she got you too! 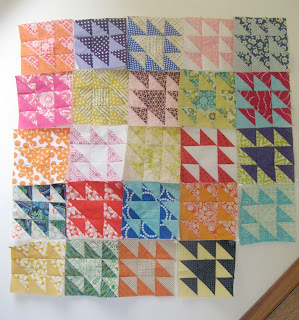 I am so close to starting a triangle quilt it's scary! Yours is lovely! Sometimes I wish I had less windows so I could have more design spaces! Flippin' 'eck Nicky it's gorgeous!! I think I prefer it to my own! I take full responsibility for getting you in to this and am chuckling at Helen's comment after you predicted you would get in to trouble. I really need a design wall - a design floor just isn't the same. I love your pyramid quilt! I dont think you need much encouragement really! 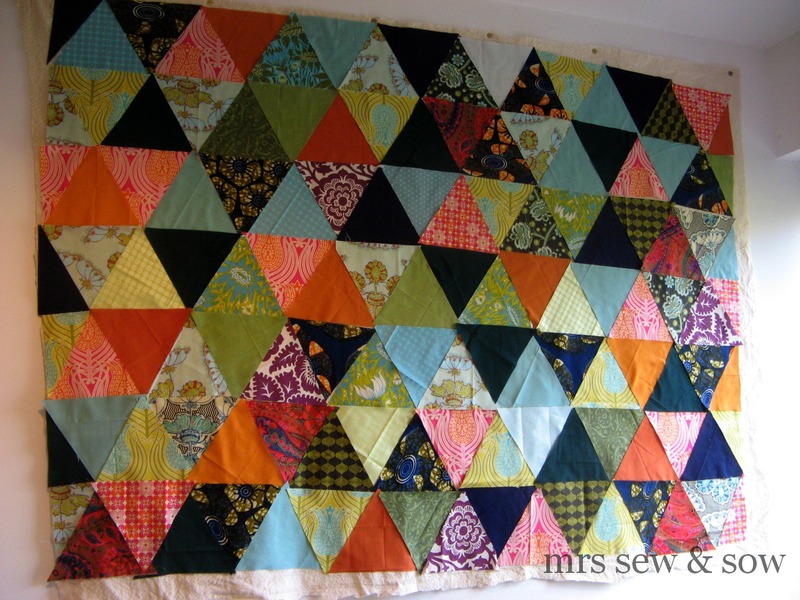 You have done two items on my list, a design wall and a triangle quilt! I think you should turn the whole house into one big design wall. If Annabella can get you cutting triangles I want to see what I can get you doing!!! Are the rest of the family happy with your expansion into wall coverings?! Thanks thanks for the heads up rethe text swap, I've signed up. I Love the triangles, think my texts may go that way! Both your quilts will be gorgeous! I suppose Annabella had a hard time talking you into this? Just do me a favour and keep her AWAY from me!!! Keep making design walls and there'll be no need for curtains or wall art!